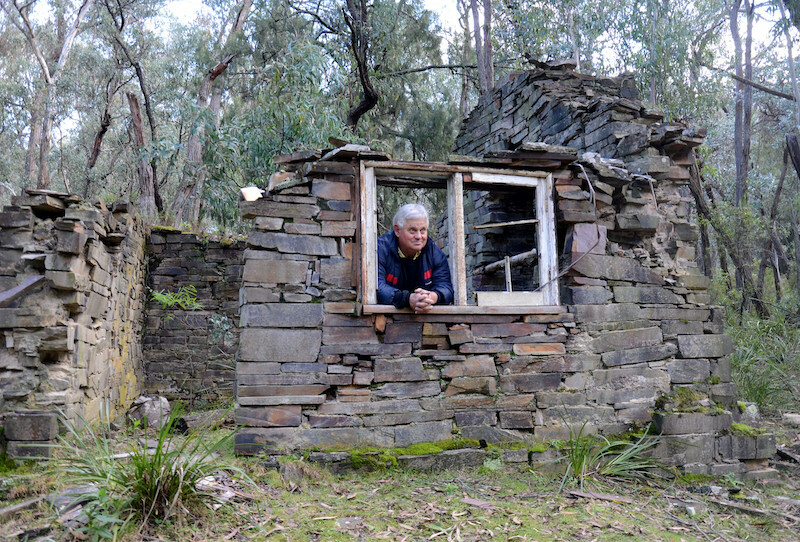 Researcher, Gary Barker inside the remains of the manager’s residence at the Cookbundoon Slate Quarry which was established in the late 1870s. Photo: Leon Oberg. 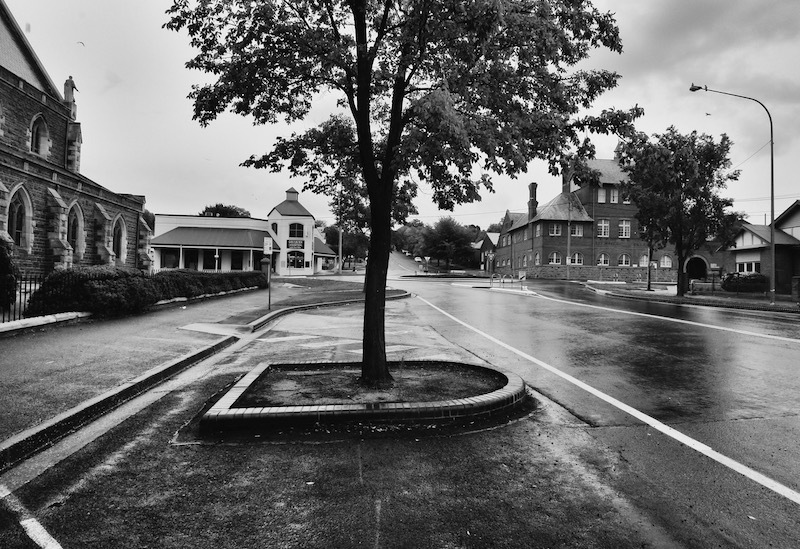 David Carmichael, Fran O’Flynn and Leon Oberg’s evocative images from lonely backroads, the sky above the city, and the history right under our noses show Goulburn in its best light. An old house on Thornford Road, a historic, largely intact Tolwong Mines at Shoalhaven Gorge and the little known Cookbundoon slate quarry behind Towrang are typical of David and Leon’s widely-admired work. A grants officer with the council, David has delighted online audiences with unusual angles of streetscapes and dramatically-lit rural scenes. For five years he has shared his fascination for old buildings among Facebook followers with similar interests. His streetscapes evoke much interest, especially from former residents reminiscing about an era when Auburn Street had ornate verandahs. His series on corner stores set off recollections of children buying lollies from friendly and not-so-friendly shop owners. 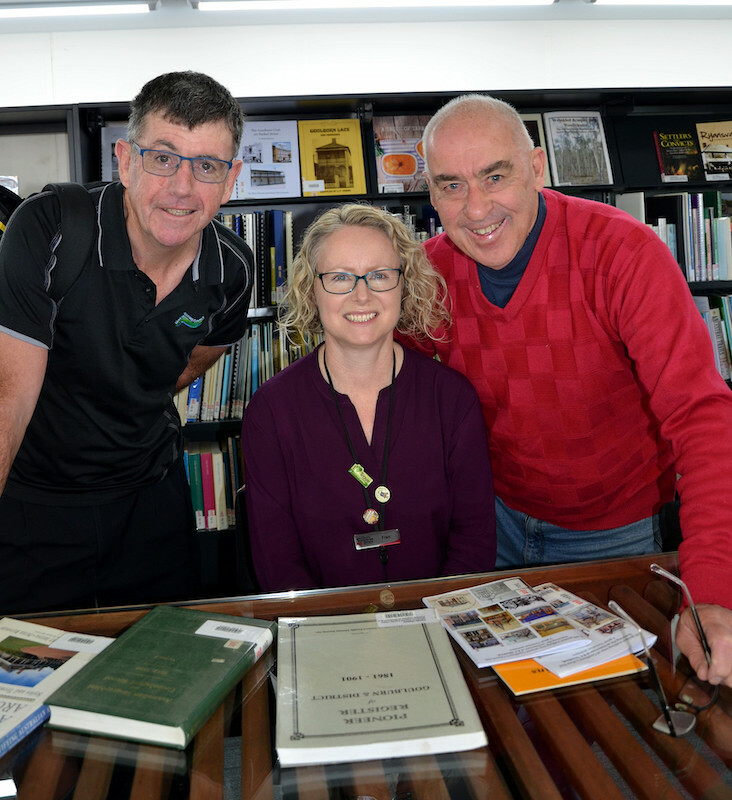 Fran O’Flynn, a local studies officer with Goulburn Mulwaree Council, delves into historic photos from the late 1800s onwards. Library assistant Madeline Young helps Fran with the captioning, and they are collecting a growing audience. Posts from the 1930s to the 1950s generate most social media interest because older folk recognise the people and places. “I think people are developing a real sense of pride in their town, and in the district, especially with David’s photos, they are so artistic and beautiful, you cannot help but think that little shed in the distance is something that has a story behind it,” Fran says. 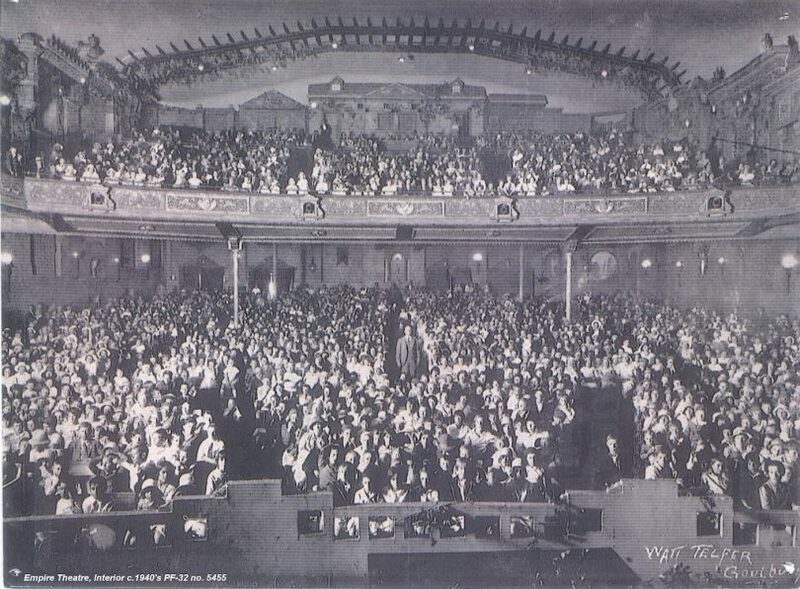 An enormous crowd in the Empire Theatre, Goulburn, in 1940. Photo-journalist and prolific rail author Leon Oberg’s aerial photos from the 1970s and 1980s draw similar reactions, as people realise how much Goulburn has changed. This was most pronounced recently with Leon’s photo of South Goulburn from the air. Most of his posts spark positive conversations. “In fact, one steam locomotive site I post to regularly attracts in excess of 300 likes for a single image which I show and that is quite rare for photographs placed on many sites,” Leon says. David Carmichael, Fran O’Flynn and Leon Oberg. Photo: Leon Oberg. Fran says David, Leon and the local studies’ photos complement one another from different angles. “When you bring it all together, it is an amazing way to share what we have and create a dialogue and opportunity for people to share as well. When people tell me their stories on their individual posts, it is like a form of history, and that is going down in time and place. That creates a real emotional response in people as well,” she says. Fran and Madeline use Flickr for albums that group subjects together like Old School Days; Retail Havens; Strolling down memory lane; On the Sheep’s back. Favourites like Kenmore Hospital, orphanages and the Odeon and Empire picture theatres never lose their allure, she says.“We like to highlight Goulburn’s social history. We do this by selecting images that contain regular people doing regular, or not so regular, things in and around Goulburn,” Fran says. “Social media following is getting bigger and bigger, and gives us an opportunity to promote heritage, hopefully this flows on to the heritage festivals, our living history festival and tourism,” she says. Recently completed street improvements near SS Peter and Paul’s Old Cathedral and the former Technical College. Photo: David Carmichael.